The subject of this book concerns what happened to one of these Greek communities, the city of Smyrna, widely considered to be the cultural and demographic center of the Hellenic presence in Asia Minor. From 1919 on it was also the center of the Greek administration sanctioned by the Entente at the end of the first World War; and where the defeated Greek army and thousands of Greek refugees expelled from their homes hoped to find passage out of Turkey in 1922. 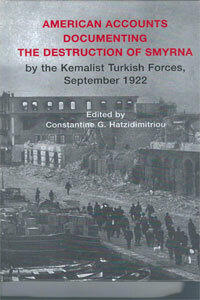 The destruction of the city of Smyrna and the murder of a large portion of its Christian population made worldwide headlines during the month of September, 78 years ago. For almost a month, a quarter of a million people in Smyrna and its environs suffered every base act of cruelty known to man. In many cases, those killed outright were more fortunate than many others who remained alive only to be tortured and suffer a painful and slow death. A martyr’s death was also the fate of Ghrysoslomos, the city’s Greek metropolitan bishop who was torn literally to pieces by a Turkish mob. Thousands flocked to the city’s long waterfront and begged to be taken aboard the many western ships that stood by watching this horrible spectacle without lifting a finger to help. These unfortunates were still there praying to God for divine intervention when on the fourth day of the slaughter the Christian portions of the city’ were consumed by flames. The great fire lasted for three days and not only forced the Greeks and Armenians from their hiding places, but obliterated the evidence of thousands of rotting corpses m the homes and narrow streets of the city. Practically all of the American and British newspapers of the lime held the army of Kemal Ataturk directly responsible for the massacre .of thousands of innocent civilians and the setting of the great fire. These acts of barbarism also were condemned my many foreign observers who wrote about them or described them in interviews to the press. In their opinion, the fire and the massacres were part of an organized plan designed to solve the minority problem and cover up the murders that had taken place. Others more familiar with the history of the region also recognized that this destruction would result in the complete Turkification of Smyrna.11 Yet., even while the ruins of this ancient Christian city were still smoldering, the despicable minions of commercial interest worked hand in hand with the Turkish government to minimize the tragedy and absolve the Kemalists of all responsibility For, in 1922, Turkey controlled the rich oil fields of Mosul, now- part of Iraq, a rich prize which Kemal dangled before each of the western powers.12 Today the Turkish government still denies that any systematic massacres of Greeks and Armenians took place in Smyrna or anywhere else in Asia Minor. Incredible as it may seem to some, it also claims that the fire that destroyed the Christian sections of the city was deliberately set by Greeks and/or Armenians. On 10th September 1922 Gazi Mustafa Kemal drove into Izmir in a modest car amid wild scenes of popular excitement. Next to him sai the Chief of the General Staff, Marshal Fevzi Pasa. He put up in a doctor’s house on the quayside, known as the Birinci Kordon (Premier Cordon), near the Kramer Palace. The hotel was burned down in the great fire which was started deliberately by enemy stragglers in Izmir on September 13th.